Forget risottos that require long cooking time and constant stirring. 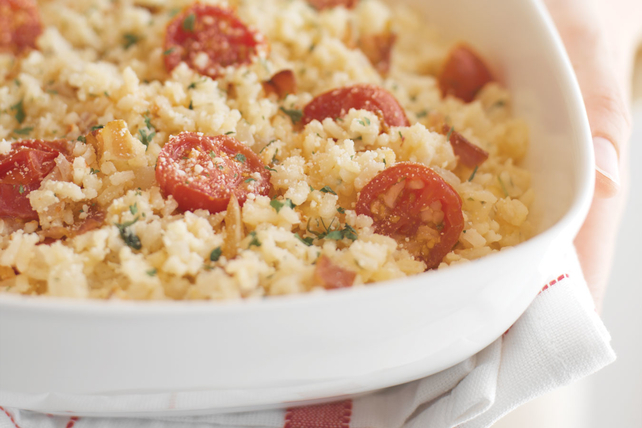 This Italian Bacon and Tomato Risotto keeps its signature creamy texture and take only 10 minutes to prep. This ultra-quick and delicious shortcut makes one great bacon and tomato risotto. Cook bacon and onions in large skillet on medium heat until bacon is crisp, stirring occasionally; drain. Add next 5 ingredients; mix well. Bring to boil. Simmer on low heat 5 min. Stir in 3 Tbsp. Parmesan cheese. Remove from heat. Let stand, covered, 5 min. before serving. Sprinkle with remaining cheese. Substitute 1/2 cup dry white wine for 1/2 cup of the broth. Prepare as directed, adding chopped cooked seafood or any of your favorite chopped vegetables, such as green beans, red peppers, well-drained thawed frozen spinach or a blend of your favorite mushrooms, along with the Parmesan cheese. Traditional risotto takes 45 min. to make. Our simplified version only takes 30 min. !